Posted August 25, 2016 by finnfemme & filed under Beauty, Fashion, Vintage. The insouciant charm of the French model, Ines de La Fressange, was not to be denied when she became the muse of Chanel designer Karl Lagerfeld in the 1980s. She had been the first model to sign an exclusive modeling contract with a haute couture fashion house. This fabulous ad – from September 1985 Vogue magazine – is for Chanel’s Coco Parfum. It strikes a chord with Ines’s cheeky yet classy look. 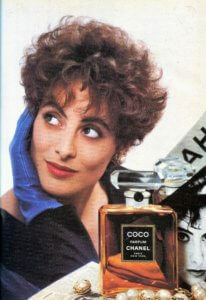 A perfect example of what was going on with Chanel in the 1980s!